A Pair of Original Ruby Slippers from the Wizard of OZ. A Pair of original Ruby slippers worn par Judy Garland in the Wzard of OZ. Wallpaper and background images in the Le Magicien d’Oz club tagged: ruby slippers dorothy classic film the wizard of oz. This Le Magicien d’Oz photo might contain steak, barbecue, and charcuterie. 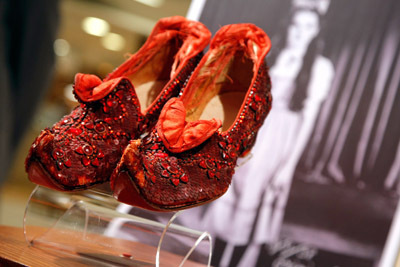 These are a pair of Ruby slippers worn by Judy Garland in The Wizard of Oz.They are on display with other ruby slippers from the film,at Saks Fifth Avanue in New York.I believe it is to commemorate the 70th Anniversary of the classic film.Hope you all like them. Interesting picture, Berni! I never saw that version of them before. Hi IsisRain,yes i agree they are unusual,i think they used differnt types of ruby slippers in the film,they are all included in the display,i would love to view them in real life wouldn't you ? Yes, there's always been something fascinating about those ruby red slippers.